Xmas Bash 5! Updates! Updates! Amanda! And Updates! 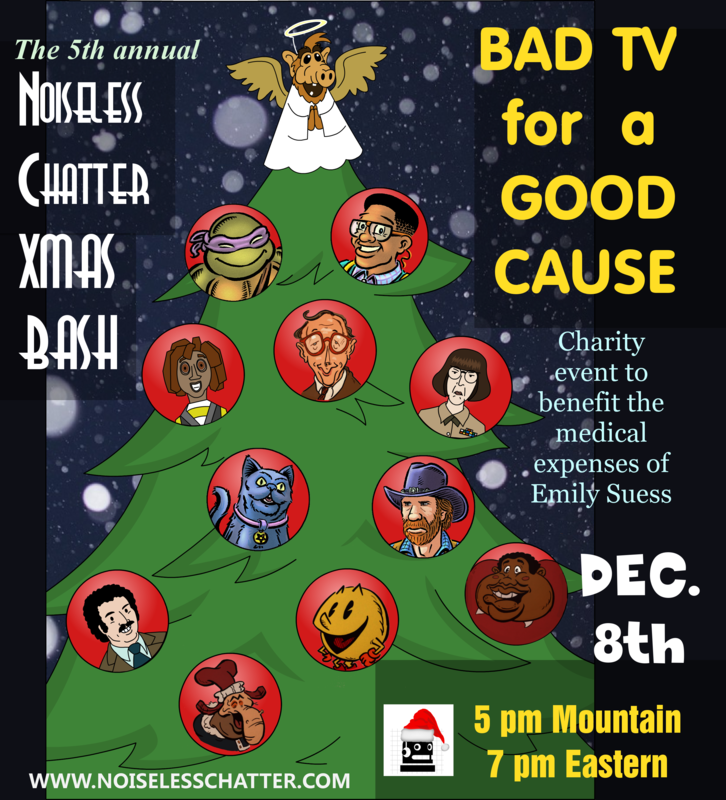 Right, okay, the super important thing to remember is that the 5th Annual Noiseless Chatter Xmas Bash! goes down in just over one week! Just come here, to this very website, at the appointed time and you’ll be there! Since I’m so bad with timezones, I feel obligated to remind you that you can RSVP via the Facebook event, which will handle time calculations and reminders for you. Moving right along, I promised more updates as the fateful night neared, and more updates shall ye have! – Amanda is back, and not theoretically anymore! As of today, I have her segments all ready to go. Amanda has been a fixture of the Bash! since the second year, which was the year that formalized the variety-show format we’ve used ever since. Every year she’s been funnier than me, and this year’s clips feature at least three of my all-time favorite Amanda moments. I hope you enjoy! – The Xmas Bash! will once again be hosted through LiveStream, so if you signed up for a (free) account last year for the chatroom, you can use the same one this year. If you didn’t, do so now instead of waiting for the night! – Speaking of things you can do now instead of waiting, this year’s stream benefits the medical expenses of Emily Suess. You can read about what she’s facing and donate ahead of the stream at her YouCaring page. That’ll free you up to enjoy the stream without the pesky task of DOING OTHER THINGS ALSO. – And speaking of LiveStream, friend of the website and all around hero Tim Caldwell will be handling the technical details once more. Remember last year, when the stream played without any problems, I didn’t have to restart multiple times due to mysterious echoes, and we didn’t get banned and have to move to a different streaming platform? Yeah…that was Tim. Let’s all celebrate Tim. – The vintage commercials this year have all been hand selected by professional hand selector Casey Roberson. So look forward to those, because usually I forget I need to pick those things and just kind of shake YouTube for a while until enough of them fall out. – We’re getting very close to being done for the year. The only outstanding clips I am waiting for are Illusionist Wes Iseli‘s, and after that I can get the stream finalized, over to Tim, and ready to go. Wes has also been a fixture since Bash #2, but has been dealing with some unexpected hardships lately. Hopefully he will still be aboard, but I certainly understand if there’s not enough time. That’s just a heads up, and hopefully you can end up ignoring this bullet. I bring it up, though, because I’m pretty sure everyone involved with the Xmas Bash! has had one monumentally crazy year, and it’s kind of a miracle everything has come together to let this happen at all. I’m grateful for everyone who has taken time that they didn’t have to help me get this together. I’m grateful as well for everyone who will take the time to tune in and be part of the world’s greatest (and only, as far as I know) Xmas party. 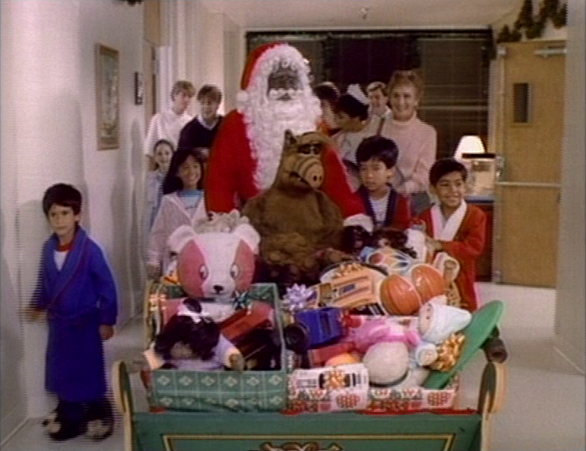 Seven forgotten Xmas specials. Heaps of bizarre Christmas music. Vintage commercials. Magic. Comedy. Original songs. Charity. And the funniest live chat on the internet. Be sure to tune in. It’s truly the best night of the year. Posted on November 28, 2017 Author Philip J ReedCategories xmas bash1 Comment on Xmas Bash 5! Updates! Updates! Amanda! And Updates! Xmas Bash! Update: Art and Music! That’s just over two weeks away! Just visit this very site at the appointed time, and join in the fun! If you like, you can register on Facebook and it will handle the time zone calculations and send you a reminder. So you don’t forget. And it’s important that you don’t forget, because it’s going to be great! I promised updates in the runup to the event, and updates are here! – Firstly, check out the promotional art! This year it was drawn by friends of the website Adam Lore, Casey Roberson, and Mike Emeritz. Thanks guys! It’s incredible! And I hate the way Willie’s looking at me! – Secondly, speaking of Adam Lore…the renaissance man will be debuting a brand new song, “The Interplanetary Christmas Tree,” featuring Dr. Airlines. (Yet another friend of the website!) This will be Adam’s fourth year providing an original Christmas song for the stream, and it’s a great one. I’m so excited to share it with you. – Thirdly, speaking of returning faces…Mistress of Ceremonies Amanda will be back! She’s recording her parts as we speak, and I’m glad, because that will give you a welcome break from my ugly mug. – Fourthly, speaking of returning faces…Illusionist Wes Iseli will be back! This is also Wes’ fourth year with the Bash!, and he’s excited, as always, to use his talents to help us raise some money for a great cause. – Fifthly, speaking of new songs, which is something I mentioned a few bullets ago, I wrote a new song! You’ll have to suffer through that, too! I hate you! – Sixthly, speaking of six, this year’s Xmas Bash! may run a little longer than usual. I’m putting it together bit by bit, and, frankly, I think we might hit six hours this year. Which means it will be the biggest and longest Xmas Bash! ever. And, y’know, for the fifth one…I think that’s fitting. We’ll see how it turns out in the edit! Four of them are family shows. Three of them are sitcoms. Two of them are not live action. One of them features talking animals. Zero of them are Rich Little’s Christmas Carol. Damn. Too many hints. NOW YOU GUESSED THEM ALL. Remember. December 8. Tune in. It’s a good one. Thanks for being a part of this, as always. It’s the single best night of the year, five years running. Posted on November 20, 2017 Author Philip J ReedCategories xmas bash3 Comments on Xmas Bash! Update: Art and Music! Yes, the 5th Annual Noiseless Chatter Xmas Bash! is coming soon. 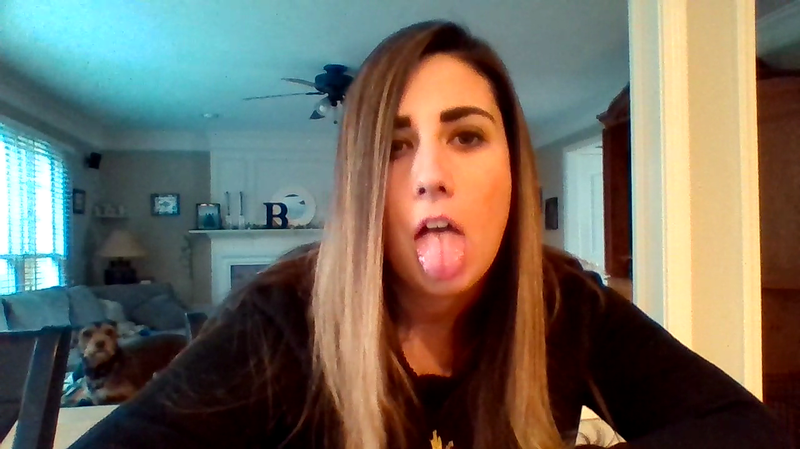 I’ve recorded my host segments, and the image above serves as a little teaser. What manner of shenanigans am I getting up to this year?! I’ve also coordinated with a few other contributors, and will spend the next few weeks getting everything squared away for the December 8 event. I’m trying to host it a little earlier this year than usual, which may hopefully make it easier for folks who work retail or travel around the holiday to attend. It’s going to be a great one, that I can promise you. I’ve unearthed some truly incredible Christmas music videos this time around, and I’ll be introducing you to seven more forgotten Christmas specials you’ll wish you never knew existed. It will be great! One significant change this time around, though, is the charitable aspect. In previous years, we’ve solicited donations for The Trevor Project. And, well, I certainly still encourage you to donate to that incredibly good cause. (Click here to do just that!) This time, though…we’re doing something a little different. This year, a good friend of mine was diagnosed with a brain tumor. This came after extended periods of expensive testing, consultation, and unnecessary runaround. The diagnosis certainly helps doctors address the root of her problem, so that’s good news. But, as you can imagine, tumors don’t come cheap. As a result, she’s in a real pinch financially. I’ve thought long and hard about this, and I’ve decided that I’d like to try to help her defray the cost of her treatment as much as possible. I’m not trying to take attention away from The Trevor Project…but I am trying to help somebody who truly deserves it. What’s more, she’s the reason the Xmas Bash! ever had a charitable component to begin with. She’s the one who inspired me to solicit donations for The Trevor Project. She’s the one who helped me to turn it into something bigger (and more important) than a night of mocking bad television. And, frankly, had she not done that, I probably would have lost interest years ago. It’s not a stretch to say that she’s the reason the Xmas Bash! exists as we know it today. And I would think it very fitting if the event could benefit her in her time of need. Emily has a YouCaring page, through which she accepts donations directly. As ever, no money comes through me; everything collected through the page goes directly to her. Please consider donating. I’ll be sharing that link throughout the night on December 8, but you’re welcome (and encouraged) to give early. Which means you won’t have to turn your attention away from “God Rest Ye, Merry Gentlemen (Gummibär Megamix)” during the stream. Emily is a great human being. She’s been through so much, and now she’s suffering through so much more. She’s been a consistent source of light and support as long as I’ve known her, and I really hope we can help her stay afloat through this. More (and happier) announcements to come as the Xmas Bash! approaches. Thanks for reading, thanks for your consideration, and, seriously, set aside December 8. It’s going to be the funniest night of the year. Announcing the 5th Annual Noiseless Chatter Xmas Bash! The Xmas Bash! is coming! What is the Xmas Bash!? 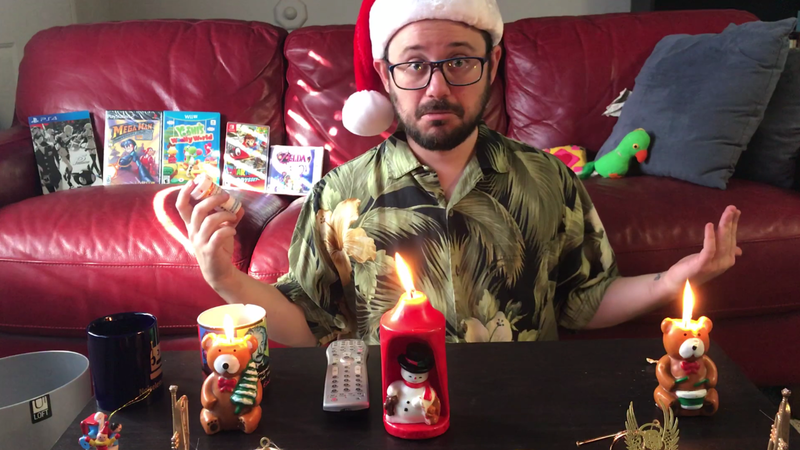 Well, it’s a live stream curated by yours truly, featuring seven rightly forgotten Christmas specials of yesteryear, along with some Christmas music you’ll wish you never heard, vintage commercials, skits, special appearances, and other surprises. It’s a fantastic night, and the hardest you will laugh all year…owing mainly to the incredible group of folks in the chat room. You can read all about the genesis and evolution of the Xmas Bash! right here, and you can listen to some of our musical interludes from the past to get a sense of what to expect. In short, if you like trash TV, terrible movies, and half-naked gummy bears, this is the event for you. Don’t miss it! I have lots more to announce in the coming weeks, but for now: mark your calendars. Or express your interest on Facebook! It will handle the time zone calculations and reminders for you. Here are the specials we’ve festively suffered through already. What yuletide offal will I forcefeed you this year? Come back to this very site on Dec. 8 at 5 pm Mountain / 7 pm Eastern and find out. Posted on November 7, 2017 November 7, 2017 Author Philip J ReedCategories xmas bash5 Comments on Announcing the 5th Annual Noiseless Chatter Xmas Bash!